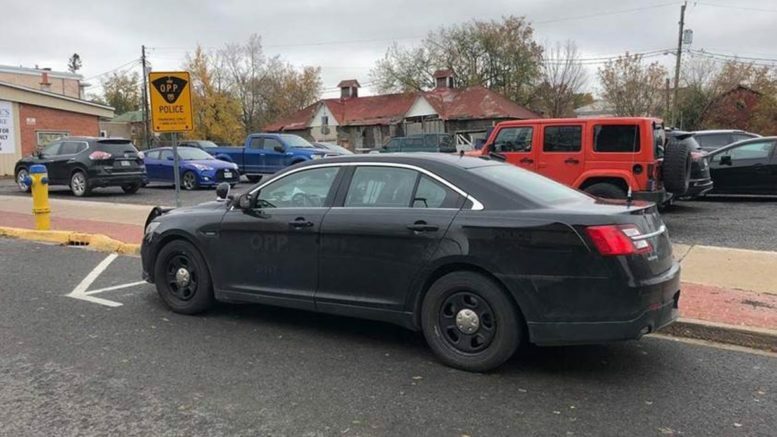 A new parking spot strictly for Napanee OPP cruisers has been established on John Street as officers increase their downtown visibility. Motorists and pedestrians travelling on John Street recently might have noticed a change to one of its parking spaces. Recently, signage has been added to restrict the space adjacent to Town Hall for use by the OPP only. Napanee OPP detachment commander Insp. Scott Semple said he asked the town for the space following a discussion he had with members of Downtown Napanee BIA earlier this year. “They were looking for some increased presence downtown and, of course, it was difficult at the time with all the construction going on,” Semple said. Asked if there’s a problem downtown that would require additional attention, Semple said police haven’t seen anything in their calls data. Instead, it was a perception retailers conveyed to him. “They felt people in the downtown area felt they weren’t as safe as they could be,” he said, adding the condition of the town during the construction activities may have contributed. Semple did concede there were concerns addressed to him about increased drug activity downtown. He said that is being addressed. The Inspector said he’s been pleased with the work of the local community street crime unit in executing drug warrants and apprehending those responsible. Still, Semple said having police on foot patrol downtown allows them to talk to people to find out what their issues are. It also offers an increased sense of safety. Semple said the OPP is already offering foot patrols downtown regularly, but he is encouraging more. With a cruiser parked there, Semple said it creates added visibility that police are nearby. Const. Doug Weese and the town’s public works staff collaborated to choose a position that can be seen by downtown shoppers and also through Market Square. It also was selected to not deter shopping visits. “We chose a spot that wouldn’t be seen as taking up a premium spot from people shopping downtown,” Semple said. The consistent location also has its advantages for the logistics of bike patrols. Semple said the OPP would store bicycles somewhere close, like at Town Hall. Police could use the bicycles to patrol the downtown area and recreation areas like Springside Park, Conservation Park, and the Napanee River Boardwalk. In the event those police officers were needed on a call elsewhere in Lennox and Addington or Hastings, Semple said the parking spot would allow them to get to a scene more quickly. The police-only restrictions on the parking spot are established through Greater Napanee’s parking bylaw. Offenders caught parking in the space will face a $50 fine.